Are you blown away by the fact that it is the last week of July already? I somehow skipped over July, and I just saw all of the back to school stuff in Target. How is this possible? I have to be honest with you about something – I really have not made anything super exciting this summer. I do cook most days, but in the summer we eat grilled chicken and salad more nights than not. Even once in awhile, I throw a steak or some shrimp into the mix. I can eat that for dinner every single night of the year and be really happy. We have been so busy with activities and traveling that I have not been really motivated to make much else. I love being able to go out to my garden and pick what looks good and make a meal out of it. 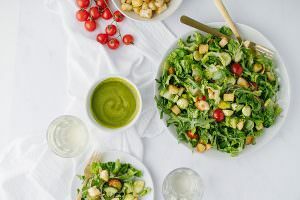 Simple and fresh is what summer is all about. 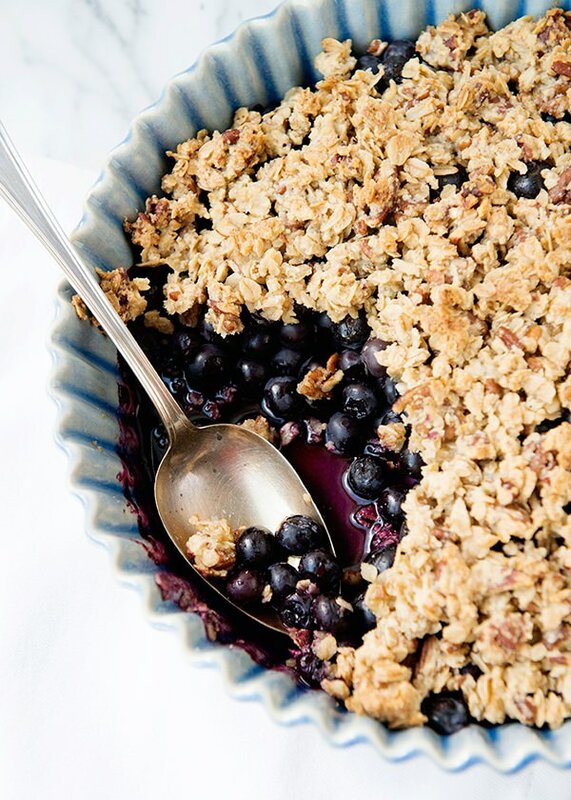 The one thing that I have made the most this summer (other than salad) is this blueberry crisp. I cannot even begin to tell you how much I love it. I have been hearing about the Bread & Wine Blueberry Crisp for awhile and finally got around to making it. I now understand why I kept seeing Instagram pictures and tweets about it. 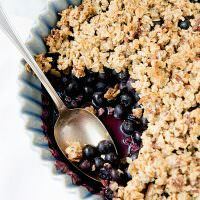 This blueberry crisp is so incredibly simple to make, you put some blueberries in a pan, and mix together a few ingredients and put it in the oven. This crisp is not overly sweet, and healthy enough for breakfast. Did I mention that it is also gluten-free and made with a natural sugar? Just about the most perfect dessert ever. I like it on its own, but feel free to add some whipped cream, vanilla ice cream, or yogurt. You can also use any kind of fruit that you like. Cherries and peaches are also in season. But I have to say, I am partial to Jersey blueberries. Wash and pick over the blueberries. Add to an 8×8 pan. Add oats, pecans, almond meal, olive oil, maple syrup, and salt to a small bowl. Mix to combine. Spread the mixture over the blueberries. Bake in a preheated 350 degree oven for 35 to 40 minutes, longer if the berries are frozen. Top with vanilla yogurt, whipped cream, or ice cream. 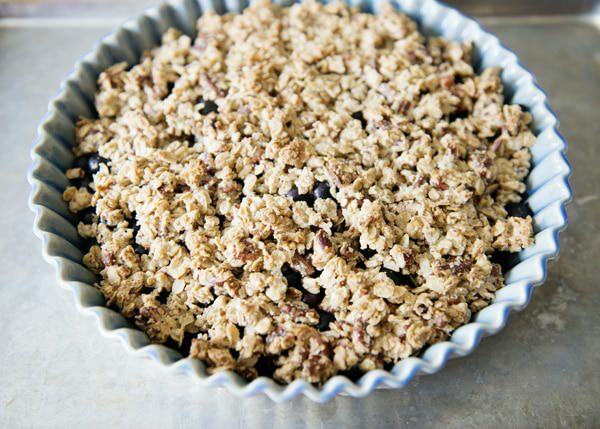 Add blueberries to an 8×8 pan or a medium size casserole dish. 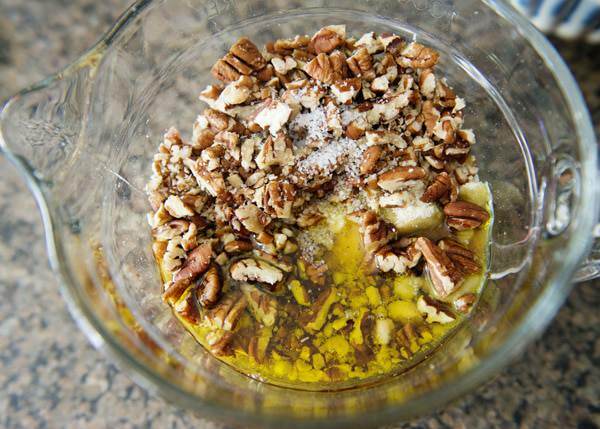 Add oats, pecans, almond meal, olive oil, maple syrup, and salt to a bowl. Toss to combine. Distribute crisp evenly over blueberries. Bake in a preheated 350 degree oven for 35 to 40 minutes, longer if the berries are frozen. Top with vanilla yogurt, whipped cream, or ice cream. This is like the epitome of summer! And this is beautiful! Love the ingredients. Beautiful! I have really been loving the blueberries this summer and this looks amazing! Wow! This is so pretty! 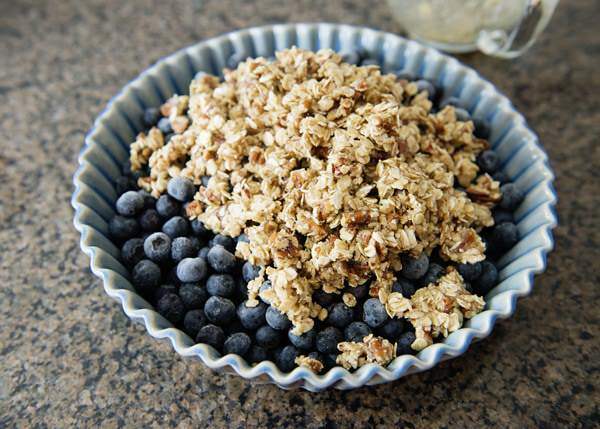 Your blueberries are gorgeous and your topping looks so perfect. What a pretty dish! 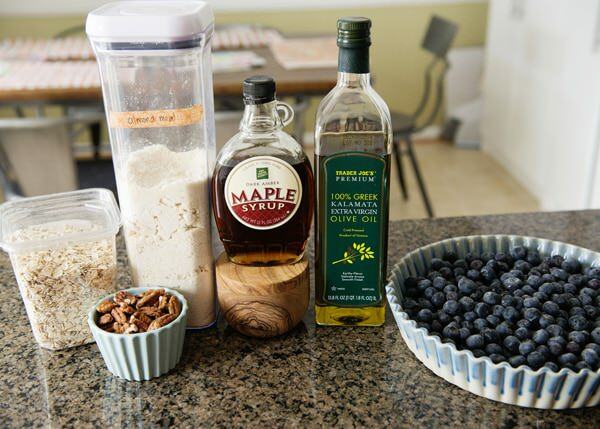 And this recipe looks like breakfast material, to me.. maple syrup and oats and blueberries topped with some yogurt? <3 Sounds perfect. Beauitiful photos!!! 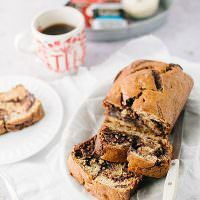 This recipe sounds great- and I especially love that it’s healthy enough to eat for breakfast AND gluten free? Love it!!! Thanks so much for sharing! Thanks Sophie! This recipe is my favorite. I have made it a ton this summer. It is really good with strawberries and all kinds of fruit. 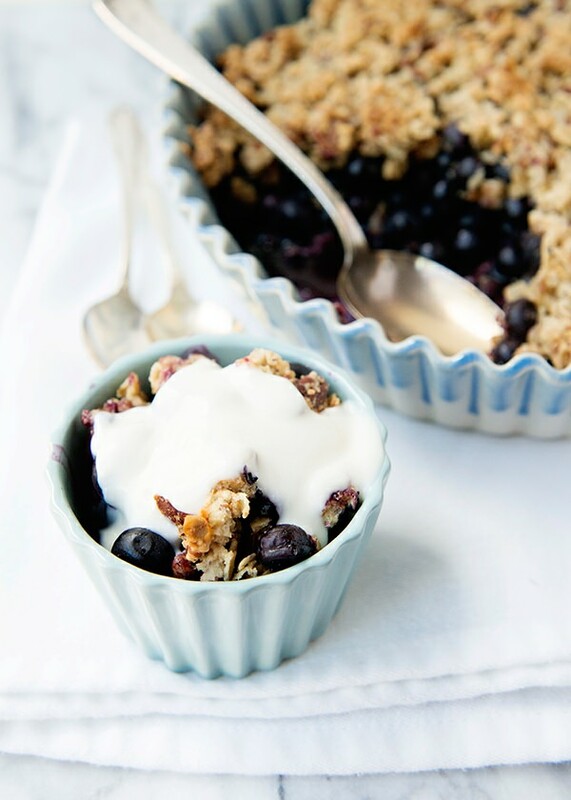 Blueberry crisp is such a treat with in season berries! Lovely recipe! Thank you! 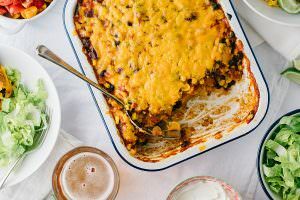 I love this recipe so much, I make it at least once a week. Cooking is so much more interesting in the summer most of the time, but our season has been so wet, it’s hard to find an abundance of quality local produce this year. The corn and peaches are just starting to come in, though, and they have been fantastic. This crisp looks wonderful. I wonder how it would bake up in a cast iron skillet on a campfire. (Looking for campfire recipes for next week). I bet that it would be perfect in cast iron. It might be a late season. I am heading to NJ this week and cannot wait to get some Jersey corn. IT’S ALMOST BLUEBERRY SEASON I CANNOT WAIT! Also, it reminds me: One day a few months ago my boyfriend was all grumpy because “the stupid blueberry festival was blocking traffic!” …it was the middle of the week in May. Blueberry season is so far away from May, I was confused. Turns out, it was a movie filming in town, and the signs were just props, haha! I am so excited to make this! I lovelovelove blueberries! Me too! This Jersey girl loves her blueberries! I am loving crisps is summer. Blueberry sounds so good. Me too! I love this one so much. i love berry crisps! yours looks so delicious! could dive right on in that topping!!! Thanks Robyn! I have made this so much over the summer and I never get tired of it. I love eating it for breakfast. I’ve seen a couple of your recipes now and they look great! However I don’t see how many servings your recipes are anywhere? Any nutritional info or servings or serving sizes etc? Thanks! I do not provide serving sizes or nutritional information. Almost every recipe serves my family of 5, so 4 to 6. I am not a nutritionist, so I do not feel comfortable making those calculations. You are more than welcome to run it through a calculator if you need to info. While I do understand that, if you are a going to run a blog that contains recipes, one would imagine that you would have serving “suggestions”. No one is expecting you to be a nutritionist or a dietician, just to know how many it serves and then the NI can be easily calculated. 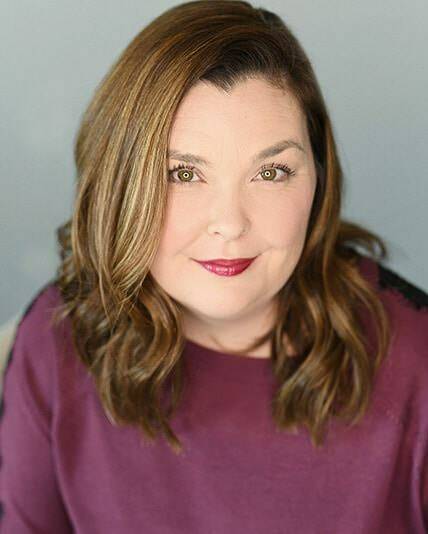 I made a decision early on not to style my recipes that way, and I am going to continue to do it this way. Assume that it serves 4 to 6. Looks wonderful! I have a large amount of frozen blueberries–what adjustments should I make for this recipe? Or are they just too watery for this? You could thaw them first and drain if they are really wet. But honestly, I just throw them in the pan. ooo yay! I will be making this soon! Made a gluten free peach cobbler/crisp a while back and my family loved it! So I know that they will adore this!! I made one tonight, I love this recipe so much. Never, ever, a dumb question. And yes, you can. You can assemble it and bake it off right before you serve it. Or, you can reheat it later. I made this last night after going blueberry picking with my son, and after my 4 year old ate a small portion for dessert, I went to put him to bed. When I came back into the kitchen, my husband was finishing the rest of the 8×8 pan!! I had to wrestle him for the last bite! LOL! I was out of olive oil, so I used coconut oil instead, and it was fabulous. Thanks for sharing! LOL! Coconut oil would be perfect, I need to try that next time I make it. Great idea! I made this a few days ago with peaches. LOVED. IT. It’s sweet, but in a delicious, maple-y kind of way, and the almond meal…YUM. I’m making it again as we speak with blackberries that I just got done picking. Thanks! I make this almost twice a week. LOVE this recipe so much. Glad you like it so much too. Can I substitute ground flax seed for almond meal? Do you think coconut flour would work in place of almond meal? I have never tried it. I really don’t know. You can always try it and see. I just made your blueberry cobbler, sooooo delicious but can it be refrigerated? Yes! I eat it for breakfast. It should be good for about 3 days. I made this last night with peaches. It was delicious! Even my gluten, dairy, and sugar eating friends who stopped by loved it. I made a couple of adjustments: a tablespoon of starch tossed with fruit, coconut oil instead of olive. Eating some now for breakfast. I love that you can use any fruit that you have around. I am glad that you liked it!